Currently I am working as Industry Value Advisor at SAP, helping high tech companies build value based justification and roadmap for digital transformation. In the past I worked as global supply chain architect for HP and supply chain strategist for Dell. 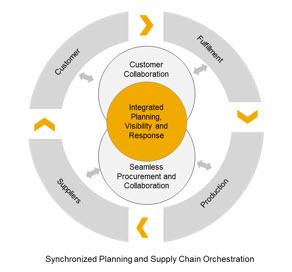 I would like to share my point of view on the current state of supply chain maturity and how industry leaders are visioning and planning transformation to digital supply chain. Continued digitization of the economy is accelerating the pace of innovation, further shortening the product lifecycle and increasing the demand volatility. At the same time supply chains are becoming global and increasingly complex. However, traditional linear supply chain models are rigid and often too slow to react to market volatility. Companies are realizing that supply chains built on technologies of early 2000 are constraining their ability to innovate and scale further. I recently worked with three high tech companies. One of them runs among the largest supply chains in the industry and has been consistently ranked very high on supply chain practices. They are realizing that they have pretty much reached the limit on reducing planning cycle times and ability to react to changes fast enough even by adding more manpower. They are still able to optimize supply chain further but in silos, diminishing the value returned. Second one is a semi-conductor company. They have long manufacturing lead time. They are going through a significant growth curve. It’s a good problem to have but they are unable to react to the late changes to the product configurations that their customers introduce or cancel/reschedule orders. Despite throwing lot of manpower they are still experiencing high inventory and obsolescence, and missing order commit dates. Third company, again a semi-conductor, is struggling to scale during the current growth cycle. They have long planning cycles, excess inventory and often expedite shipments to meet customer SLA. They want to prepare themselves for the future with responsive and agile supply chain where they can take advantage of opportunities in the cyclical market without adding manpower. causing margin and revenue loss, high supply chain cost, excess and obsolete inventory and poor customer service levels. All three companies are looking for ways to remove planning silos, reduce planning cycle time, ability to plan in an integrated environment and make execution decision in real-time to respond to supply chain changes effectively and efficiently. Recent technology advancements like in-memory real-time computing, cloud, mobility, IoT (Internet of Things) and business networks are enabling digital supply chain models removing past technology barriers that have forced companies to linear, siloed and batch oriented supply chains.